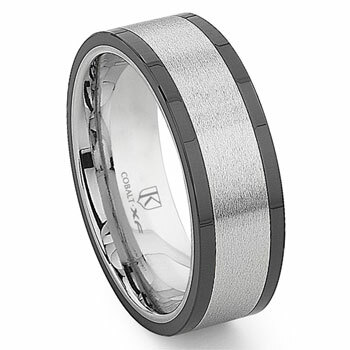 Men love a strong masculine wedding ring and the cobalt xf chrome 8mm matte finish two-tone flat wedding band is bound to impress any soon to be groom. Made of cobalt chrome in white gold color with a matte finish ands two dark colored edges surrouning the edges of the men's wedding band. The ring is 8 millimeters wide and comes in a range of sizing options. If you have any questions on how to select the right size ring please contact us for help as these rings cannot be resized. Our cobalt xf chrome 8mm matte finish two-tone flat wedding band is one of the best choices for a wedding band a couple can choose. It is 100% hypoallergenic so it will not cause an allergic reaction when worn. The ring is made of one of the worlds strongest metal alloys, making it nearly impossible to damage, it is also for sale at a price anyone can easily afford.